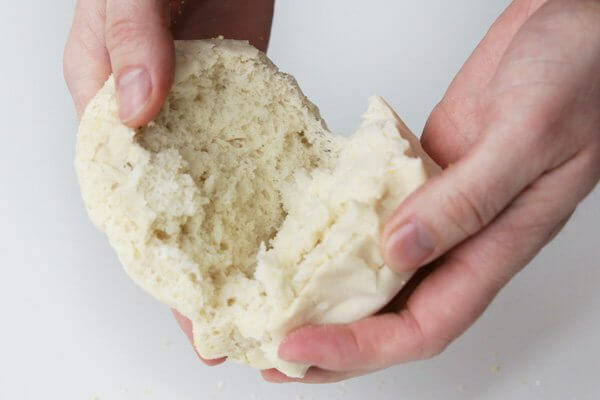 While commercial English muffins are fine, you’ll develop a better appreciation for them after making your own sourdough English muffins at home. These are much more moist and flavourful than their packaged counterparts. Warm-out-of-the-oven muffins are delicious with just some butter. Or they can be toasted with butter and jam. Or use them for the best-ever eggs Benedict. Makes 2 dozen English muffins. The evening before cooking the English muffins, add 4 cups flour and the milk to the starter mixture. Mix to combine, cover, and let sit at room temperature overnight. Add the remaining 1 1/2 cups flour, baking soda, sugar and salt to the starter mixture. Turn the dough onto a floured surface and knead for 5 minutes until smooth and only slightly tacky, adding more flour as required. Divide the dough into 24 equally-sized pieces, by first dividing into 2, then 2 again, then 2 again. You’ll now have 8 pieces; divide each of these pieces into 3. Roll each piece of dough into a ball, then flatten into a disc 3/4-inch thick. Set on a sheet of parchment paper dusted with cornmeal. Once all the discs have been shaped, sprinkle the tops with cornmeal, cover with parchment paper and a dish towel. Let the dough rise for 45 minutes. 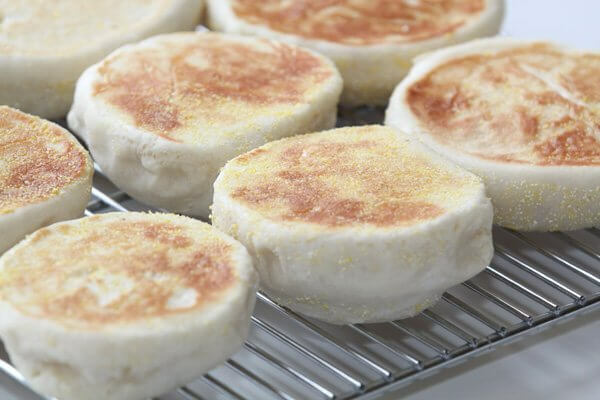 Cook the English muffins on a lightly-oiled electric griddle at 275°F (or a stovetop griddle on medium heat) for 10 minutes on each side, or until a nice golden brown. Cool on a wire rack.